The first four D7 nacelles to be loaded on to the Rotra Vente vessel from Siemens Gamesa’s (SGRE) new Cuxhaven production site are destined for the 309MW Belgian Rentel offshore wind farm, with another 38 to follow. The 42 turbines come in 7.35MW power mode and will be commissioned later this year. Until the Cuxhaven plant reaches full capacity later this summer, some D7 nacelles will still be produced in Brande. Cuxhaven also serves as a supply harbour for towers made by third-party suppliers for SGRE’s D7 turbines. After Rentel, SGRE will supply D7 turbines to the 588MW Beatrice and the 1,218MW Hornsea One projects, both in the British North Sea. Once the final D7 units have been delivered by 2020, both Cuxhaven and Hull will switch to producing next-generation 8-9MW SG 8.0-167 DD successor turbines, with first shipments scheduled for 2021. The new model features unchanged nacelle and hub dimensions, but longer blades at 81.5 metres. SGRE is building an SG 8.0-167 DD prototype with a 167-metre rotor, featuring the longer B82 blades, to be installed at the Østerild test field in Denmark this autumn. An 8MW SWT-8.0-154 prototype with a 154-metre rotor is already in test operation. 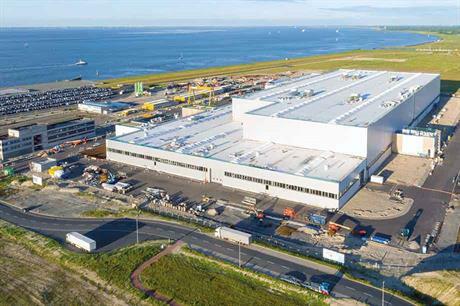 The spacious Cuxhaven facility, built in just 13 months, comprises long, wide production halls. It was built to accommodate future turbine generations like the much larger 10MW-plus D1X platform expected in the mid-2020s. The layout also offers all the extra space required for their final assembly, testing and pre-commissioning. The high-density factory floors can carry 400 tonnes/m2, and, together with the 32-metre-high ceilings, this makes it possible to install matching hoisting and rolling equipment to move fully completed nacelles around the factory, explains Hans Timm, manager of the Cuxhaven plant. "This is SGRE’s first dedicated factory space with all main assembly operations under one roof," he says. "All parts arrive by ship or road at the factory entrance gates, where they are checked and cleaned, and temporarily stored if necessary. This area marks the beginning of three parallel production lines for nacelle back-end, generator, and rotor hub assembly." Timm, who was involved in developing the factory plans and design layout from the beginning, says the overall goal was to industrialise all processes for handling big components. The development teams closely studied truck-manufacturing processes, looking for similarities. "We introduced an internal just-in-sequence system for parts supply next to nacelle back-end specific positions in the line during assembly," says Timm. "This is an integral part of a common manufacturing-industry materials-flow concept. One recent milestone achievement in support of our production philosophy is that the third-party supplier of our rear frames decided to build a factory almost right at our doorstep." To handle very large components and sub-assemblies, SGRE developed special hoisting equipment and uses electrical indoor movers to provide "pollution-free" internal transportation of heavy sub-assemblies mounted on assembly frames, starting with nacelle back-ends in various assembly stages along line stations and later for the nacelles towards completion. Both turbine and truck manufacturing involve handling large, heavy components, but a major difference is in the number of units produced, Timm points out. While truck facilities typically make about 500 vehicles a month, the average state-of-the-art offshore wind facility produces around 400 turbines a year. Nacelle back-end assembly commences with the huge cast main carrier brought in and put upside down for mounting the yaw bearing, after which it is rotated 180 degrees to mount the yaw motors. The following steps include fitting two fabricated steel rear frame members, other mechanical and electrical gear, and power-electronic equipment including the two converters, MV-transformer and plastic canopy. A visual difference between the D6 and the D7 is that the latter model’s enlarged compartment for the 66kV transformer is located underneath the nacelle cover behind the tower. The helicopter hoisting platform is also incorporated into the back-end. "The rooftop cooler was initally located in the nacelle rear with the 2011 D6 prototype, but for the second prototype and all other turbines moved to the permanent position right behind the rotor, which optimises cooling performance," says Timm. "Here in Cuxhaven, the hoisting platform and cooler units are assembled in the factory, saving time and cost. With D6 and D7 turbines production in Brande, they must be assembled separately in Esbjerg, mainly for road transport-logistical reasons." Hub assembly involve the use of two robots to place blade-bearing bolts and individually tighten each of these with the right torque. "After mounting a blade bearing into the correct position, a small robot picks up a stud (high-tensile steel rod with threaded ends), washer and nut, and hands it over to the second, larger robot. This robot then fits the stud, tightens the nut and, in a final step, applies the pre-determined pre-tensioning. "Technicians work in parallel inside the same hubs to fit the hydraulic cylinders, piping and accumulator. The current set-up enables the assembly of two hubs side by side." This hi-tech in-house project was led by a specialised "standardisation" group based in Denmark, in cooperation with an industrial partner, and is now completed and fully functional. These specialists are now looking at their next big challenge, the automated greasing of bolts and studs applied all over each turbine. Multiple potential additional benefits include always applying the right torque and far fewer issues when parts are demounted in the field. PMG manufacture is similar to Lindø, again a hi-tech process that involves a pick-and-placement robot for the magnets through all preparation stages, including size measurements, magnetisation, and checking magnetic field strength. A second placement robot inserts each magnet in a pre-determined position inside the generator-rotor steel ring circumference to ensure that the shape remains perfectly round during the process. After finishing back-end assembly, the unit is pre-tested and pre-commissioned, enabled by the fact that it incorporates both converters and MV-transformer. The next phase involves the "marriage line", positioned perpendicular to the production lines. "The first station in the marriage line is for mounting a completed pre-tested generator to its matching back-end. The next station is for mounting hubs to generators. "Each complete finished nacelle undergoes a vigorous 24-hour pre-commissioning test before being moved from the factory to the ro-ro vessel by self-propelled modular transporters." A lot of effort is dedicated to the digitalisation of all production processes and the entire value chain, with traceability of data a key focus. In case a specific component fails, this makes it possible to check whether all individual bolts were tightened with the right pre-tension during production, for example. This year the Cuxhaven factory will produce a total of 300 nacelles in a two-shifts, five days a week system, but this number can be boosted to a maximum 400 units a year with a three-shift, six-day week schedule if required. On 20 March, Siemens Gamesa Renewable Energy (SGRE) shipped the first batch of 7MW SWT-7.0-154 D7 nacelles from its state-of-the-art, 56,000km2 plant in Cuxhaven, Lower Saxony. 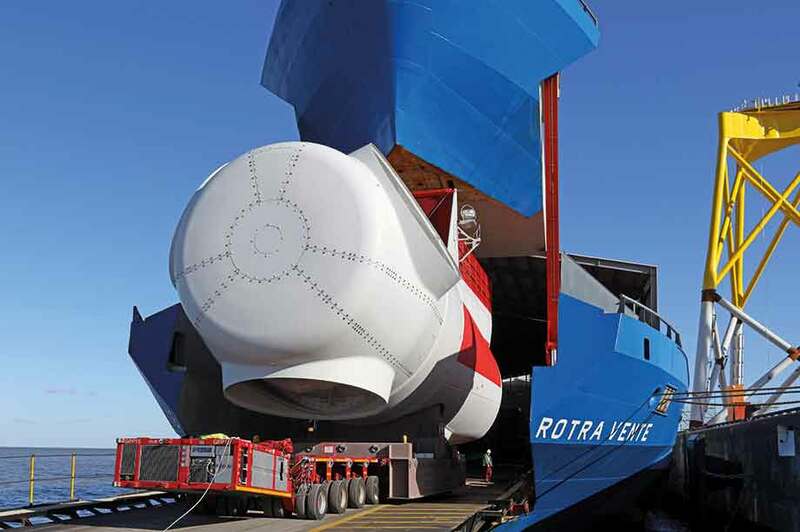 The company’s Rotra Vente vessel had arrived earlier that day from the Danish port of Esbjerg, already loaded with tower segments to accompany the four D7 nacelles. The 140-metre long purpose-built "roll-on/roll-off" (ro-ro) vessel was first used to ship SWT-7.0-154 nacelles, produced in Brande, Denmark, from Esbjerg to the wind-farm installation harbours in November 2016. Its sister vessel, the Rotra Mare, which came into service in the first half of 2017, can accommodate either three complete towers (nine sections) or 12 rotor blades. The Rotra Mare was deployed to ship tower sections from Esbjerg, and B75 blades made in Aalborg, Denmark and Hull, UK, to project sites. By March 2018, both vessels together completed more than 130 sea voyages, carrying nacelles, towers and blades for over 250 turbines spread over eight different offshore wind farms in Europe. A unique feature of SGRE’s transport-logistics solution is that remotely controlled self-propelled modular transporters (SPMTs) move complete pre-commissioned nacelles, mounted on transport frames, from factory exits into the Rotra Vente. Offloading involves SPMTs carrying out the processes in reverse order, while additional remotely controlled transportation equipment is deployed to load and offload blades and tower sections. 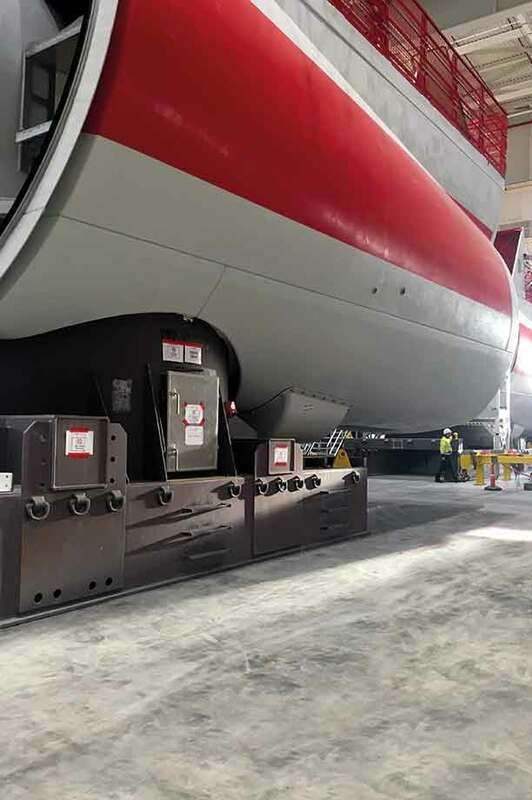 With each nacelle weighing about 400 tonnes, eliminating the need for heavy cranes is another benefit of the ro-ro vessel, with more than 2,000 hoisting operations avoided over the past 18 months. The combination of the two ro-ro vessels, the new blade plant in Hull and the now-operational Cuxhaven plant for D7 nacelles has effectively eliminated the need for long-distance land transportation of large and heavy components to shipping/installation ports. While the D6 model is gradually being phased out, a small portion of B75 blades for D7 turbines continues to be supplied from Aalborg. Most B75 blades are now made in Hull, which also serves as a pre-assembly port for offshore towers. The Rotra vessels have quickly become an integral part of SGRE’s marine-logistics concept, says SGRE Offshore CEO Andreas Nauen. "As our manufacturing footprint and logistics concept continue to mature, we make additional progress on lowering the levelised costs of energy for offshore wind."